I can't brag about this enough! YUMMMY!! Line the bottom and sides of a greased 15 inch X 10 inch and 1 inch deep jelly roll pan with parchment paper, grease the paper and set aside. In a mixing bowl (I used my Kitchen Aid mixer it works like a dream on this) add room temperature cream cheese and milk blend together until smooth. Beat in parmesan cheese and flour until blended smooth, then beat in eggs and mix well. Pour mixture in prepared pan. Bake on 375 for 20 mins. Meanwhile, in a large skillet, sauté peppers, onion and garlic for about 5 mins or until tender, and then add mushrooms, chicken, ham and sauté all together for about another 5 mins. Keep warm. Once cooked turn omelet onto a work surface, peel off parchment paper and return omelet to the jelly roll pan. Sprinkle with cheese, then vegetable /meat mixture and give it a few extra shakes of parmesan cheese salt and pepper to taste. If needed add back to the oven to melt cheese. 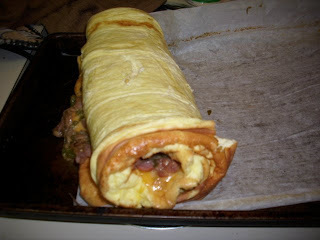 Once cheese is melted roll up the omelet jelly roll style, starting with a short side. Slice to serve... Enjoy!